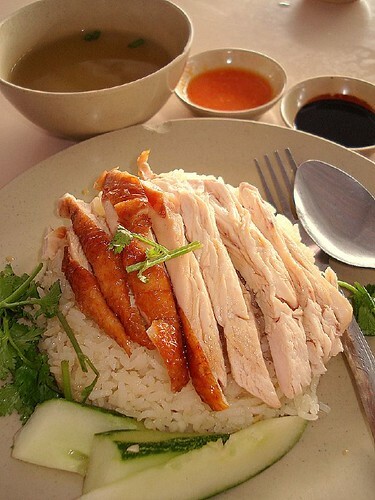 Chicken rice with herbal-scented soup, chili sauce and sweet dark soy sauce, originally uploaded by Camemberu. Back to budget food! 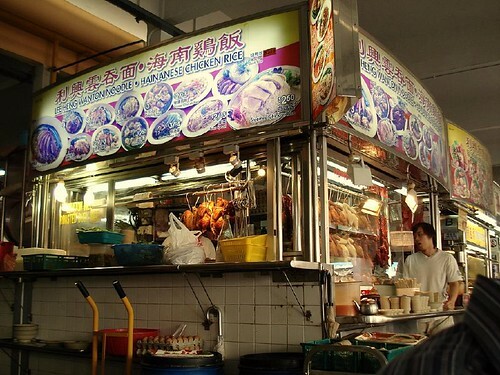 Chicken rice is the nation's favourite, and there are no less than five stalls at Marine Parade Central (not counting the numerous Muslim stalls that serve Malay-style chicken rice too). I haven't tried any of them until recently. We picked Lee Heng to start with. Hey, not too bad. Good rice, grains separate (no clumping!) and flavourful. Meat is decent (it really is just the base for the chili sauce and soy sauce, which are also good here). What is pleasantly surprising here is the complimentary bowl of soup - this so often tastes like dishwater at other places but here it is wonderfully tinged with Chinese herbal notes. If you order a two person portion of chicken rice, they give you a large bowl where you can actually see the herbs used (red dates, etc). For a moment, I'm thinking Blade Runner but it's really just Marine Parade Central, originally uploaded by Camemberu. Ice: I get confinement food for lunch and dinner. This is breakfast hehe. The high tea...well, was in between lunch and dinner! (^@^): Hmm, yeah, I also prefer roast chicken to steamed. But I'll take note of that stall you mentioned! I frequent this stall too. Their noodles too are not bad.